I park my cafe racer outside of the coffee bar, hanging the helmet on the handlebar. Inside there is a stool waiting for me by the window. I take off my leather jacket and sunglasses while I am ordering a big cup of black coffee. From my maroon shoulder bag, I find my latest purchase. I pick it up, slide the cardboard box open and take a good look at the fancy, miniature, aluminium “lunchbox”. I nod, approving the cool, urban packaging. Inside, I find the vintage inspired Aevig Valkyr. I pull it up and take a good look at the details of the sharp design, smell the leather rally strap and set the time. It feels good. It is time to suit up, leaving half a cup of coffee as I’m giving the dude behind the counter a fist bump. Helmet on, checking the time one last time before I ride into the sunset. Well, maybe this is taking it a bit too far, but if you can sense the feeling I got when I unwrapped the package, that is what I want you to have in mind when reading this review of the Aevig Valkyr. 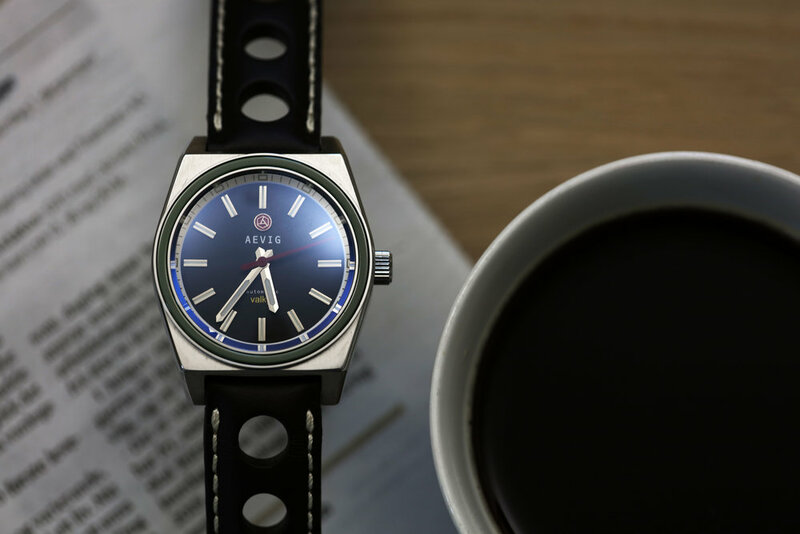 Aevig, founded in 2013 by Chip Yuen, is all about being inspired by the best design from back in the days and use today’s materials and features to end up with stylish and solid timepieces. The last years, it seems like new watches pop up on every corner, so not to end up as just another watch brand, you really must make something that stands out from the crowd. That is what Chip has managed through Aevig. Since I first noticed the brand, I felt that this was something different, something more than all the other vintage inspired brands out there. 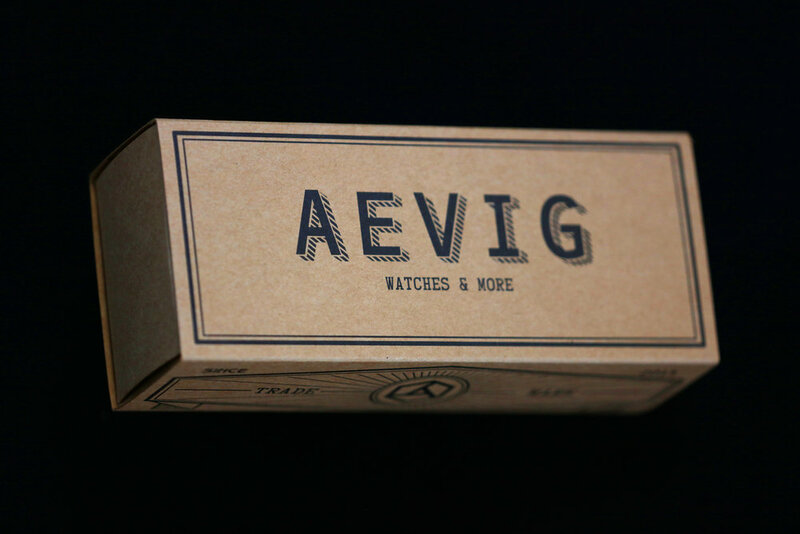 If I would use one word to describe why Aevig is, for me, a desirable brand, it must be character. Being only five years young, Aevig has produced several watches and near-future releases are coming up. A thing I like about this brand is that they listen to their fans and customers. The main design is mostly plotted, but opinions regarding features and adjustments are open for the community to suggest. Not all can get through, but as an example, the new Huldra, that is coming in 2019, will have a date window, due to many requests. When you can get that close to a brand, I feel there is a connection between us, which I really appreciate. There is something about the Valkyr that I really like. The 39mm case fits my wrist like a glove and being 14mm in height, it slips (relatively) easily under my sweater. The length from lug to lug is 48mm and I’m wondering if I might have requested the size of this watch… The Valkyr really hits the soft spot with its measurements. But the main thing that catch my eye with this model is the shapes. The boxy, stainless steel case is all about sharp angles and attitude. 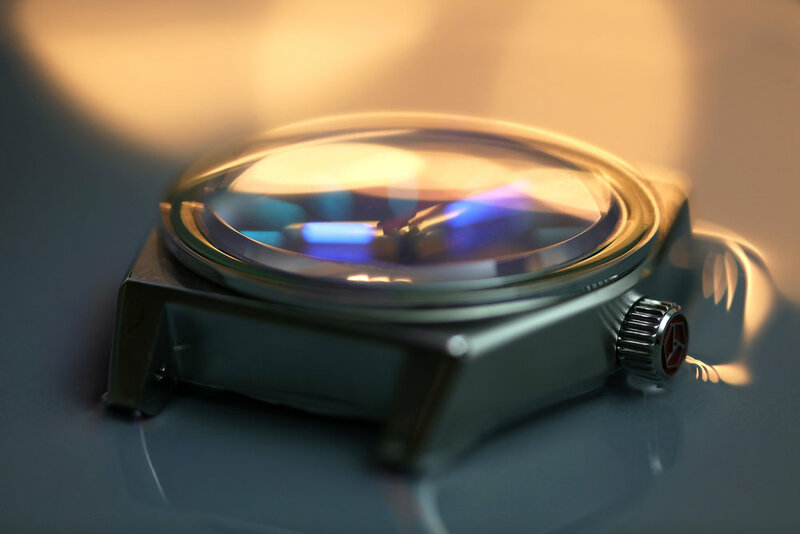 From the top, the watch is fitted with a double domed sapphire crystal that has AR coating on the inside. The shape of the crystal reminds me of the old acrylics and is the perfect option to keep the vintage style. The fixed bezel, with a green, ceramic insert, is another great detail. It keeps everything firmly in place and gives the front a nice, old-school finish. 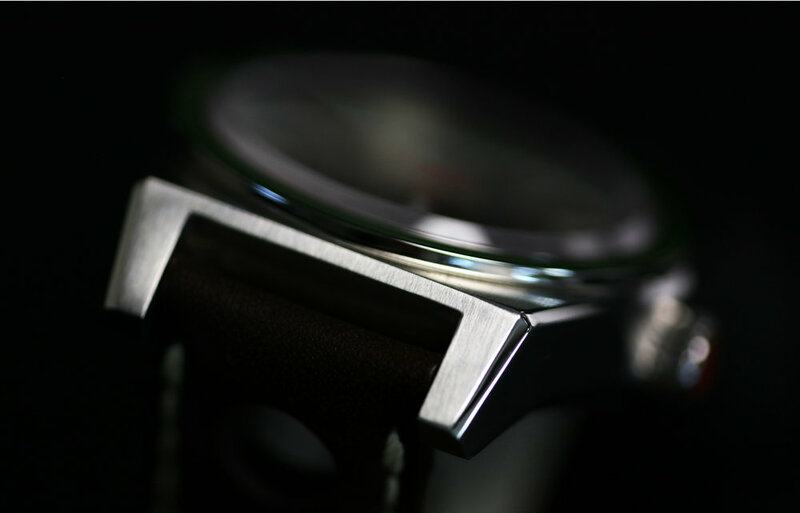 The 39mm x 48mm case of the Valkyr is flat, edgy and mostly brushed, with polished, bevelled edges. Most watches come with bended lugs and soft, round details, but that is not the case with this watch. The lugs drop down at a sharp angle making the appearance quite masculine and packed with self-confidence. The screw down crown is placed at 3 o’clock, featuring the red, aperture-like Aevig logo. Underneath the double domed sapphire, you will find a vintage styled, matte black dial surrounded by a white chapter ring. No numerals used, keeping it all clean and tidy. The hour makers and the hour and minute hands are polished, inserted with stripes of luminova. The red second hand matches the Aevig logo nicely and is a good contrast to the dial. The logo and “Aevig” are placed under the twelve-hour marker and “Automatic” and the yellow “Valkyr”-sign lies above the six-hour marker. Blue hands and green markers. Inside the Valkyr, the 24 jewels, Miyota 9015 is running. It is a well proven movement that does its job, without any fuzz or being too fancy. It has approximately 42 hours of power reserve and keeps the time well. The accuracy is set to -10 to +30 seconds per day. It is a movement that is well known in the world of microbrand watches, due to its reliability, its easy to obtain and it has hacking seconds. The 9015 is has a calendar function, so when setting time, you will notice the “calendar-click” as you pull out the crown, even if the Valkyr is a no-date. The 20mm wide, brown rally strap is made of good quality leather with white seams. It is fitted with a solid, stainless steel buckle and feels very comfortable on the wrist. The inside of the strap is white/grey’ish and branded with the Aevig logo. I think this strap suits the watch very well, fulfilling the vintage sports and racing looks. To sum this up with a conclusion, it is no doubt that this is a very cool watch. As I mentioned earlier, I get the feeling that this watch has got a lot of self-confidence and charm. 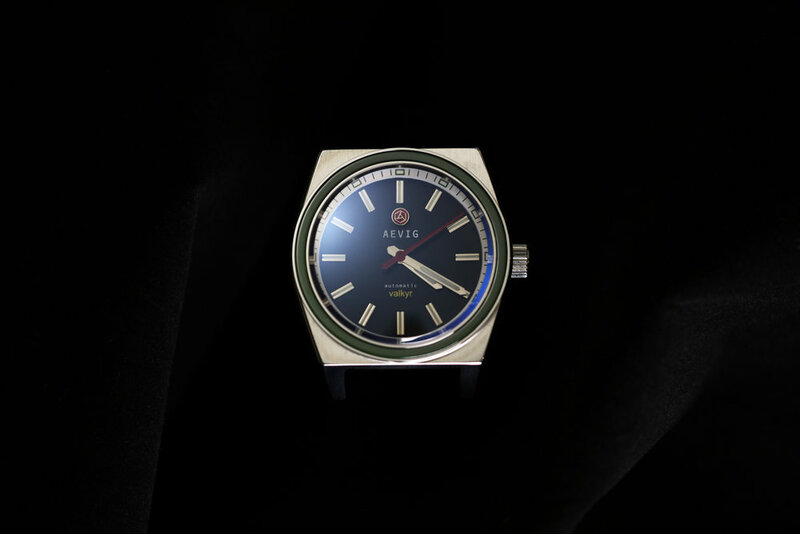 Put it in a room with other, classic and more expensive brands, the Valkyr will not be bothered and try to be anything other than what it is, a charming, stylish, vintage inspired watch with a lot of attitude. Automatic movement, sapphire crystal, ceramic bezel, leather rally strap and a unique case at the modest price of €379 is nothing but great value! I think I will use this watch a little longer than I am supposed to, bring it to the coffee bar some more and just enjoy the company of charming looks.